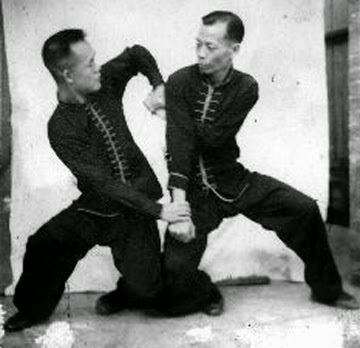 e used to call them “two man” forms…which unconsciously removed the idea of a woman’s presence even though when I started Kung Fu, women were practising these forms, and were doing so with speed and power. 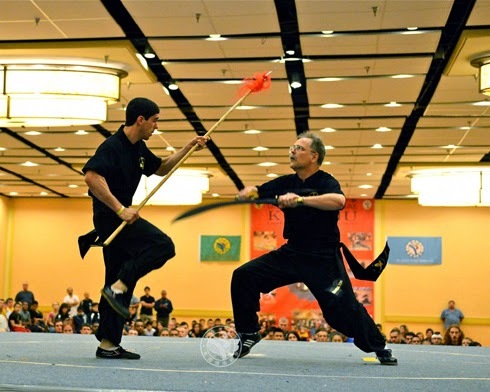 Now, these pre-set empty hand or weapons routines are normally referred to as “two person” forms. Or “three person” forms, for the obvious reasons. It’s a healthy transformation, bringing our sisters into the language equation. But that’s not the main purpose of this post. I recognize that most readers have never been involved in pre-set two partner training. There are Judo Kata, done with an uke. Modern Karate has explored multiple partner training in everything from one-step to five-step sparring as well as its pre-set Bunkai drills. Sensei Greg Magwood has formed a mini pre-set form out of the first ten techniques of 27 Movements which helps get his young students to become excited about Kata. I know other instructors have done the same with various Kata. An open question – might this type of training suit you? The main argument against two person forms is “real self defense isn’t pre-set”. These forms, the argument continues, have nothing to do with high intensity sparring practise, which is always free-style and improvised. 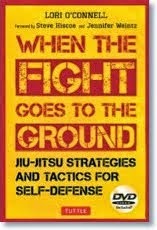 In other words…closest to the way self defense works in the street. 1. Empty hand vs. empty hand with both partners standing still or moving about. 2. Weapons. Both partners may carry the same weapons. 3. Empty hand versus weapons…and so on. So, like any Taekwondo pattern, you’ll find a set of movements always repeated in the same order. Person A throws a kick, Person B blocks and then throws a punch, etc. In the first two person form I learned, Person A performed a series of movements which Person B always responded to with a block and then a counterattack which Person A would respond to, etc. At a certain point, the movements would blend over, so I would become Person B and my partner would do the Person B part. And so on, for as long as you wanted to. 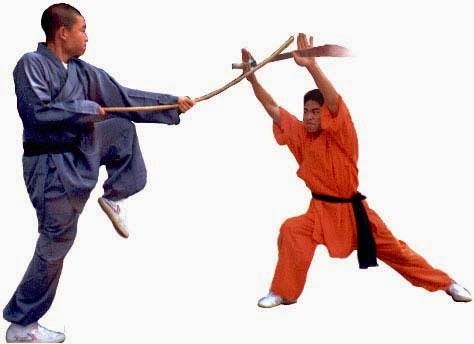 I learned a Tai Chi push hand form that follows the same logic…at some point Person A switches to become Person B and vice versa. However, with the first two person weapons form I learned – broadsword versus spear – once both fighters concluded with their sides of the form, that was it, the game was over. (Earlier on, I remember arriving at the kwoon with the desire to work on the form and asking: “Where’s so and so?”…because, at the time, “so and so” was the only one who knew the spear side of the form). But, again, the original question is: how can forms like these lead to improved sparring, or, better yet, combat capability, because ”martial art” does translate into “war art”? 2. A cross section of fighting methods within that system. For example, sparring doesn’t always involve locks, sweeps, takedowns and throws but in some Eagle Claw two person forms, you concentrate on these as well as kicking, blocking, punching and striking. 3. Systems like Yang Tai Chi or Uechi Ryu Karate come equipped with all sorts of nuances from timing to physical movements of deception to complex fighting strategies. Two person forms allow you to generate all of these skills and concepts plus the items found in examples 1 and 2 above, into one sequence of time and space providing you with the opportunity to train in the whole scope of your system or art. And if you do enough of this kind of training, the entire system may eventually be at your fingertips. In sparring, you most often use the techniques that work for you. I’ve seen and experienced this often enough. If a side kick or back fist worked for you five years ago, chances are these techniques are still the crowns in your fighting repertoire. Your system’s eye gouges, chokes, arm breaks, etc. get short thrift in a sparring geared environment. But those techniques are brutally important, and probably go way back in your particular system. Two person sets offer a safe – and precise – method of practising these. Then you crank up the speed. And that’s when everything happens. That low kick blast to the knee, the wrist grab and elbow break, the shift to one side…they begin to reach way beyond pretence. At this furious level, you are indeed fighting, pre-set or not. In fact, pre-set doesn’t matter anymore. Pure skill – and incredible speed – are the only ways to counter what happens next. Indeed, you know what happens next…but that won’t help you. The stuff is coming at you, and it’s coming hard. Skill, by now ingrained, is your only defense. 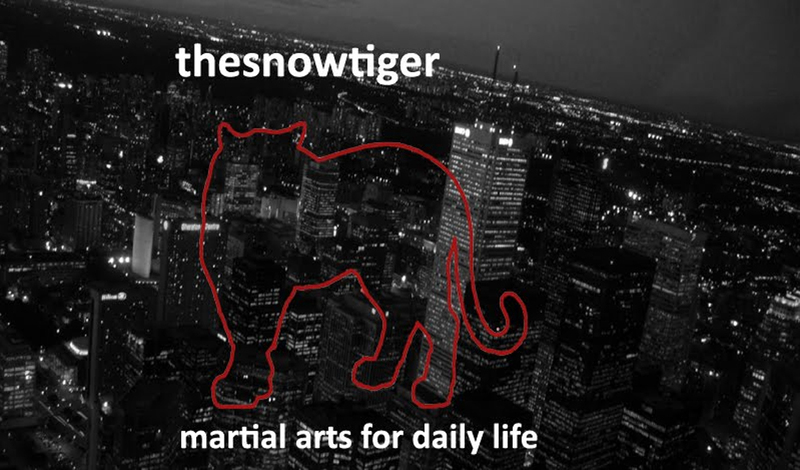 Can you imagine a scenario where punches, wrist locks, arm bars, knee breaks are all treated equally, each delivered over and over with extreme speed and precision? At this stage of training, I highly recommend wearing eye protection, mouth guards and personal protection. Sparring gloves?...only the kind with open fingers. Please remember, you’ll most likely use every part of your hand. What if your system doesn’t contain any existing two partner forms but you’re hooked on the idea of giving this type of training a try? Make up your own. It would be a good idea to first check with your instructor or someone else higher up in your lineage. A martial artist respects her or his system first of all and always treats those who have come before with deep loyalty. Don’t refer to your two person form as an official breakthrough routine; simply call it another personal training device. 1. With a partner’s help, create a list of your system’s major hand and foot techniques. Add some locks, throws, takedowns, etc. if you have them. (This sounds like a recipe!). 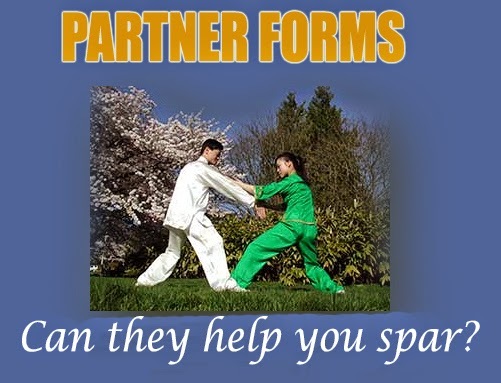 If you train in Judo, Aikido, Jiu Jitsu, Hapkido, etc., you may not want to fully throw your partner. Take the foot sweep to the first point of instability, then let your partner recover to perform the next move. 2. List the combative strategies contained in your system and feed them into the mix so that the techniques begin to speak the language of strategy. 3. If you’d like to include some ground work, incorporate a group of skills where partner trade techniques back and forth in a flowing pattern…chokes, knee locks, arm bars. Start slowly at first. Experiment. Once both partners are comfortable with the routine, slowly begin to expand the speed limits. Depending on the nature of the techniques, you may also want to perform the routine blindfolded!